The types and categories found in glass art are formed basically by “How it was made”. The techniques and processes an artist uses to make contemporary art glass are often used in describing the artwork. Many and multiple techniques are used to make glass… But sometimes the most common terms and definitions can be a bit confusing. Take the term ‘glass blowing’ for instance… Sometimes people think of ‘glass blowing’ as something done using long blow pipes with molten glass from a furnace. Other times, they may refer to ‘flame working’ as glass blowing. Are they kind of the same thing? Yes… Are they totally different? Yes. Artwork made from ‘hot glass’ includes blown glass, solid sculpted glass, and cast glass. Basically, hot glass working involves molten glass with a temperature around 2000° degrees. This hot viscous glass can be used in glass blowing, sculpting, and casting into molds. Work such as glass sculpture, hand blown bowls, vases, goblets, and ornaments are commonly made with hot glass from a furnace. Cast glass or ‘glass casting’ is usually done by ladling the hot molten glass into a mold. Warm glass is a process that involves heating the glass in an oven or kiln. Common terms often used for kiln made glass include ‘slumped glass’, ‘fused glass’, ‘kiln glass’, ‘kiln casted glass’, ‘bent glass’, ‘glass bending’, and ‘pate de verre’. slumping – Typically involves heating flat plate or sheet glass to a temperature between 1250° – 1400° degrees. This is just hot enough for the glass to bend or move with gravity. Generally the glass is placed onto a mold and is formed during the ‘slumping’ process. Fused glass – This term is used when pieces of glass are heated hot enough to melt together. The temperature needed to ‘fuse’ glass is hotter than needed to slump glass. 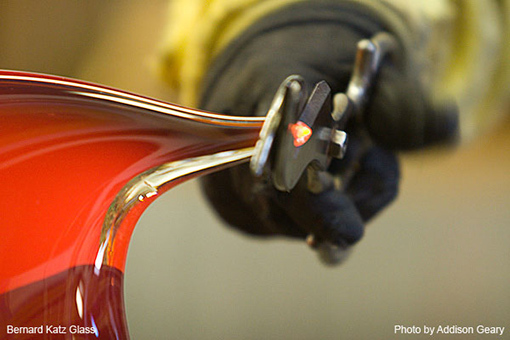 Typically, fusing glass is done with a temperature between 1400° – 1600° degrees. ‘Slumping‘ and ‘fusing‘ are often done together. Kiln casting glass can involve hot molten glass poured into a mold inside the kiln. Casting with molds in a kiln includes using crushed glass or a powdery glass paste known as ‘pate de verre‘. Cold working or ‘cold worked’ glass involves any techniques or processes done to the glass that is not hot. This type of glass working is often done in conjunction with hot and warm glass. Grinding, polishing, etching, or engraving can be examples of cold-working techniques. Etched glass, sometimes called ‘frosted‘ glass, can be a much generalized term referring to the surface of the glass being ‘etched’ away. Acid etched glass – This involves applying an acid, like hydrofluoric acid, to the surface of the glass. This creates a matte finish and can give the glass a translucent quality. Sandblasted glass – Sandblasting glass involves blasting with air a gritty material against the surface of the glass. Aluminum oxide or silica carbide can be typical grit mediums often used in sandblasting glass. This can create the same effect as acid etching. I tend to use this method for my work because I have better control… And it is much safer than acid etching. I decided this type of glass art needed to be in its own category. Many of the same glass working techniques are used in ‘flame working’ or ‘lampworking’. The techniques used in ‘lampworking‘ are more closely related to those found in scientific glass blowing. Pre-made ‘borosilicate’ glass tubes and rods are typically used in lampworking. The glass tubing or glass rods are heated with a hand held or bench torch in order to form the glass. Amazing glass sculpture and artwork can be made with the flame working process… This glass making technique is also used for items such as beads, jewelry, ornaments, and small figurines. Flame working with borosilicate glass is popular because it can handle extreme temperature changes without cracking. Glass is a very versatile material, with many different ways available for creating art in glass. This is just a very basic overview about some common ways contemporary art glass can be made. Links throughout this article can guide you to more in-depth information about many of the above processes.